I have a McCulloch Super 250 I am trying to get started. It belonged to my late Grandfather. It's complete, I have replaced spark plug, cleaned air & fuel filters as best I can. There is compression & have a fuel mix of 25:1. I did notice some oil (minimal) seeping from exhaust after trying to start it today. Any info on trying to get it started would be appreciated, also any info on locating parts for servicing if/when needed e.g. air filter, gaskets etc. That saw has in my opinion the best reed valve engine McCulloch ever made ,the 87 cc model . Due to the age more than likely the carb needs rebuilt which is no problem if it's a Tillotson model HL .If it's a Mac/Walbro flat back it is a problem because kits are rare for that model . The oil is probabley residue from the impulse operated oil pump .It may straighten out once it's running .I might add with this type oiling system it's not uncommon for it to have some leakage especially after sitting idle for a long time .However if it's leaking badly it will cause an oil film on the spark plug and you will not be able to start it . What you might do is remove the plug,drain all the oil from the tank ,squirt some starting fluid on the plug and blow it off with compressed air .Squirt some mix gas into the cylinder and again blow it clean with compressed air and try starting it . If you can get it running it will flush the residue of oil from thecrankcase but it will smoke like it's burning pine knots until it does . I gave it a bit of a clean up today and the carby looks pretty clean, although I don't know what model it is, let's hope it's the Tillotson. I will check this and try your other suggestions. Thanks again, I'll get back with updates soon. 72magoo,welcome to the forum. Good luck with the saw. We are a nice bunch on here. Some forums are kinda rough on new members asking questions. Ask away and be happyhappyhappy. Did as you suggested Al, also flushed out fuel tank and replaced spark plug lead...then with a little perseverance got it running . A lot of start stop start stop then it ran for 15 - 20 seconds and stopped. Now it wont start at all because it appears I have lost spark . Unsure as to what carby it has as there is no identifying marks. Possibly a Tillotson from what I have found online, however if anyone has suggestions on how to identify the carby it would be appreciated. Cheers and thanks again for your advice, will provide another update soon. It's sat for a long time and more than likely the points need burnished .They set at 18 thou open .Air gap on the coil to flywheel 10-12 thou . The flywheel should have two tapped holes you use a bar type puller on and they should be 1/4" 20 thread . Now regardless of what anybody says a reed valve McCulloch in a good state of tune usually starts very easily .It's when they get out of tune you can tug on them forever before they putt . 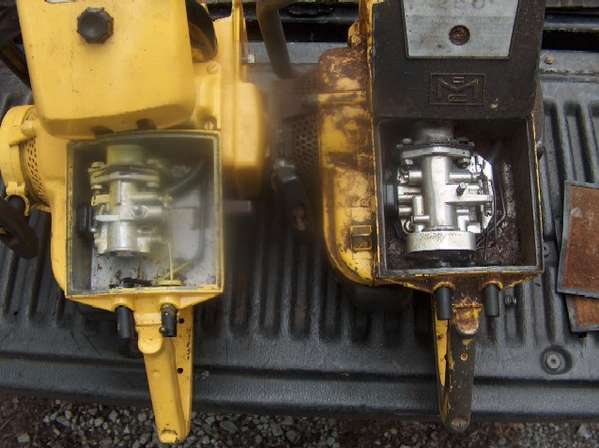 Here's a picture showing both models of carb .Both are 250 Macs . The left is a Tillotson model Hl ,right is the infamous flat back . What year is my McCulloch Super 250?